I met up with my globe-trotting foodie friend for a second day in a row, but in a much, much nicer setting today. 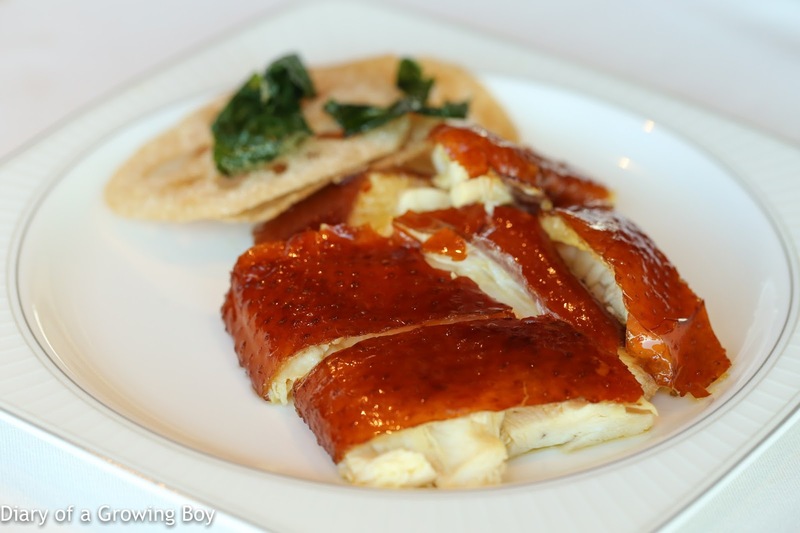 When I got in touch with him a few weeks ago and inquired about his plans for eating around Hong Kong, I wasn't the least bit surprised to hear that the only reservation that he made was at Lung King Heen (龍景軒). Naturally he invited me to join him there for lunch. When I arrived at the restaurant, I could see that my friend was already chatting with Chef Chan Yan Tak (陳恩德). Knowing my friend's history with the restaurant and the hotel, I had no doubt that we would be well taken care of today. Sure enough, restaurant manager Simpson Yeung came to greet us shortly, and asked whether we'd like to have Chef Chan do something special for us. We set some broad parameters but left the rest up to the chef. 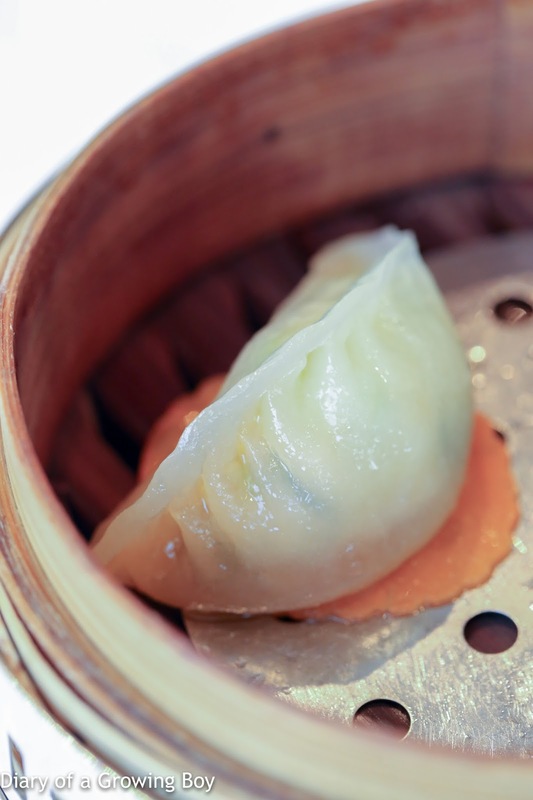 We would start with a few dim sum items - and a few of them would appear to be off-menu (hence the generic descriptions here). I mentioned that I'd perhaps like a glass of Champagne, and moments later sommelier Billy Yeung came over with the Champagne trolley. He very generously offered each of us a glass of 2003 Tarlant La Matinale - a brut nature with zero dosage. That much was obvious, given the noticeable acidity on the palate. The nose was nice and toasty, and a little yeasty. Full-bodied with a nice and long finish. A lovely wine for us to start our meal with. 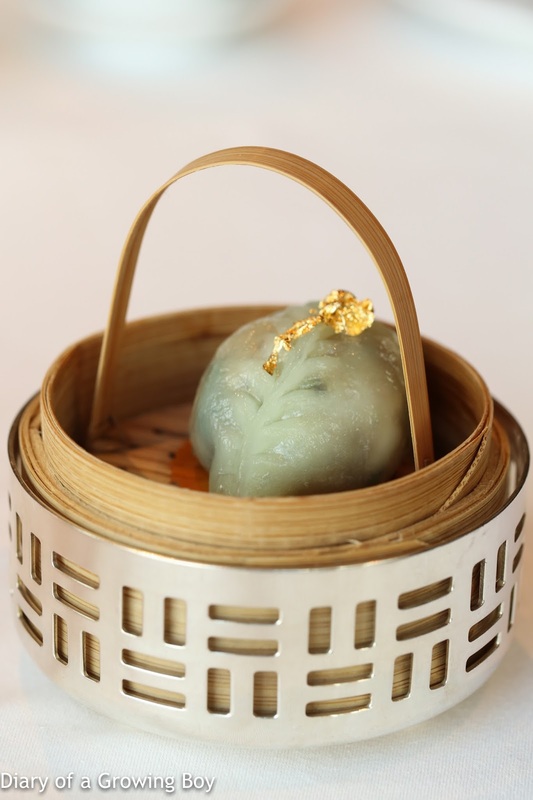 Steamed lobster and water chestnut dumpling in fermented bean sauce (豉汁龍蝦馬蹄餃) - you can tell this is a very luxe item by the gold foil they put on top... and of course the fact that the filling includes lobster. Nice flavors here, and the inclusion of diced cucumber and water chestnut definitely provided a much crunchier texture. 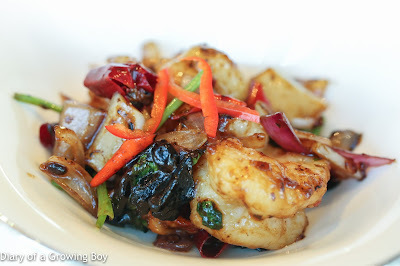 Steamed assorted mushroom dumplings with goji berries (百合杞子雜菌餃) - I liked this a lot. Very curious to see wolfberries - otherwise known as goji (枸杞) berries - and lily bulbs here... both provided noticeable sweetness while the latter lent a crunchy as well as starchy texture. Additional crunch came with the celery. 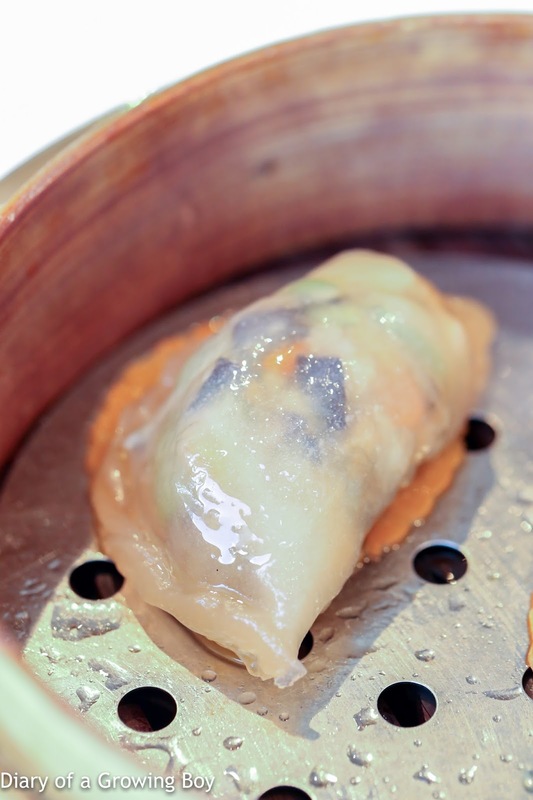 Steamed crab meat dumpling (蒸蟹肉餃) - this was pretty decent, and no real crunchy bits inside so the texture was pretty uniformly soft. 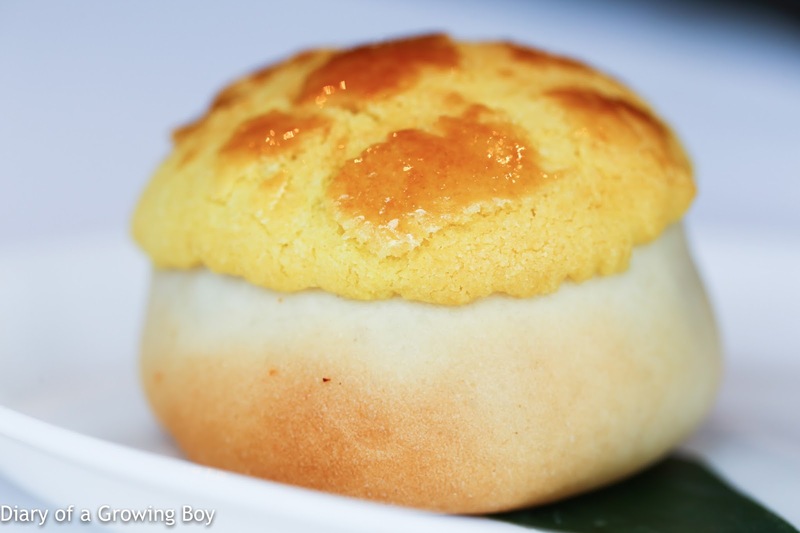 Baked taro puff (芋角) - these types of taro puffs are among my favorite items to order when having dim sum, so I'm real happy that I got to have one. How surprising that unlike most versions I have had, this was devoid of any meat whatsoever. Other than the taro mash, I could only find shiitake mushrooms inside. But I loooove the flaky shell as always. And the best thing? There's not even a hint of the taste of baking soda, which is sometimes prominent in the ones found elsewhere. Baked barbecued pork buns with pine nuts (崧子叉燒菠蘿包) - it's been so long since I've come here for dim sum that I totally forgot they add pine nuts inside, and actually quite a lot. This is a nice touch, because it adds both fragrance and some extra crunch. Otherwise the char siu (叉燒) inside was enveloped in thick sauce that was a little sweeter than I remembered. Spring rolls (春卷) - we were told that this was a spring roll with vegetables, and indeed it wasn't obvious that there was any meat or seafood inside. 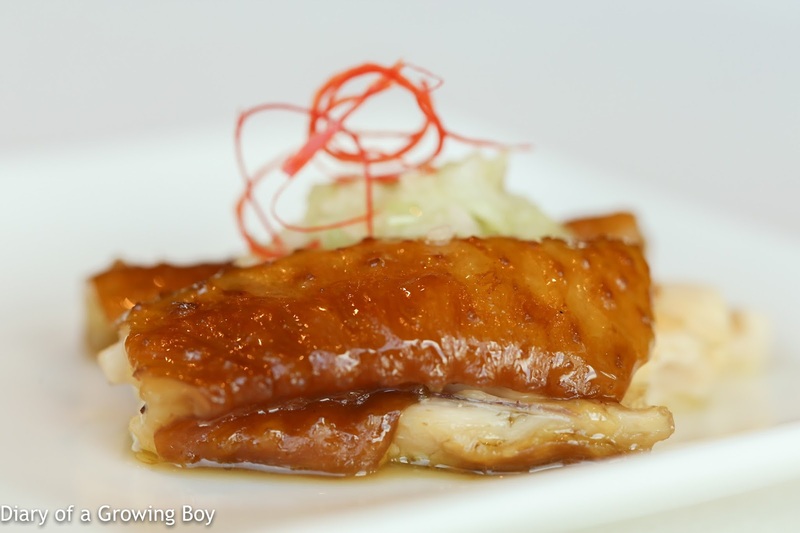 Marinated fragrant chicken in soy sauce (玫瑰豉油雞) - actually pretty tasty... especially the soy-marinated skin, and thankfully we got a pretty small serving. Barbecued pork with honey sauce (蜜汁燒叉燒) - these were two very, very satisfying chunks of soft and delicious pork. 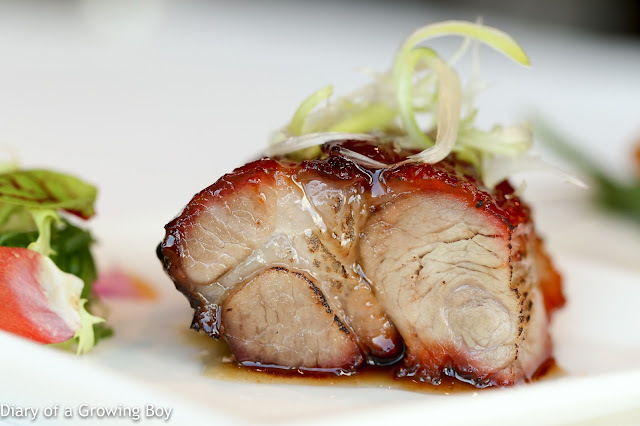 The tender and flavorful fat is clear to the eye, but the supposed lean parts were also very tender. This is the kind of stuff where I'd be happy just ordering up a whole plate of, along with a bowl of steamed rice, and have myself a simple yet incredibly gratifying meal. 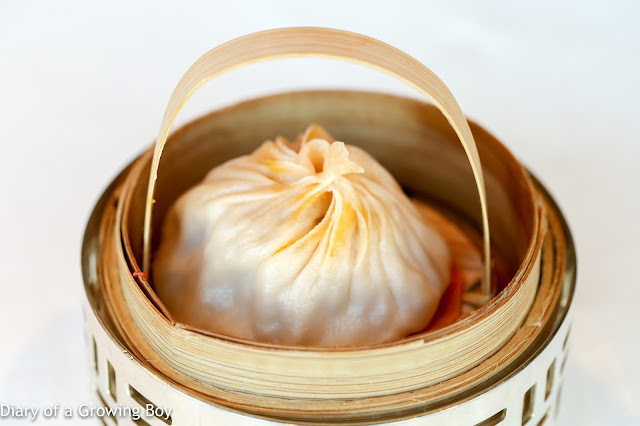 Xiaolongbao with hairy crab roe (蟹粉小籠包) - it's hairy crab season once again, so when we thought we needed more dim sum, Simpson suggested that we take one of these. I was surprised by the size, as it was actually bigger than even the ones at Jia Jia Tang Bao (佳家湯包) in Shanghai. While the filling was still a mix of ground pork and hairy crab meat/roe, I have to admit that the mixture was so silky and smooth that I had to do a visual check to confirm that there really was ground pork in there. Pretty nice. While the wrapper was very thin and fine, it seemed a little dry by the time I got around to eating it after a couple of minutes. 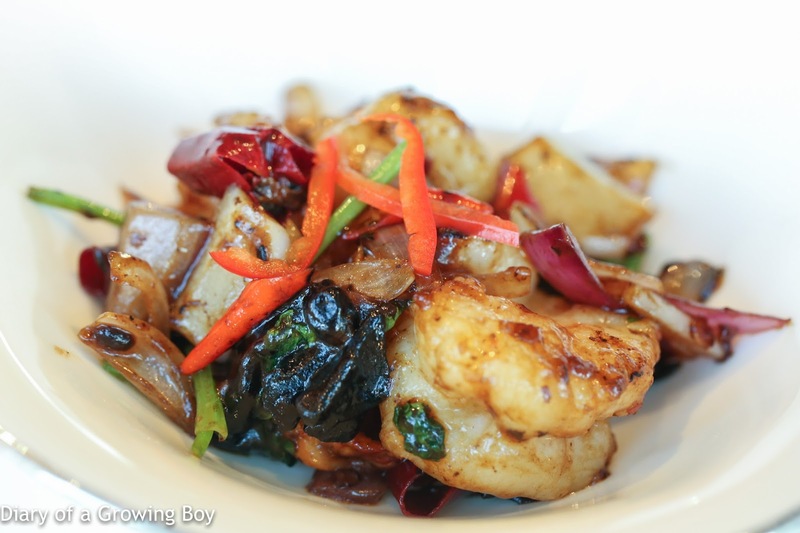 Wok-fried prawns with organic black garlic and dried chilli (有機黑蒜爆大千蝦球) - this was an unexpected dish, sent out by the chef as it appears to be a signature dish. Unfortunately, this also turned out to be my least favorite dish of the day. 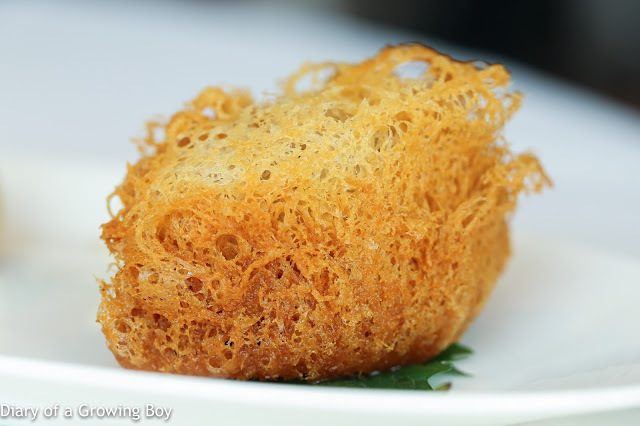 I know that Chinese chefs often treat their prawns with baking soda to give them a crunchy texture, but I think something went wrong here... 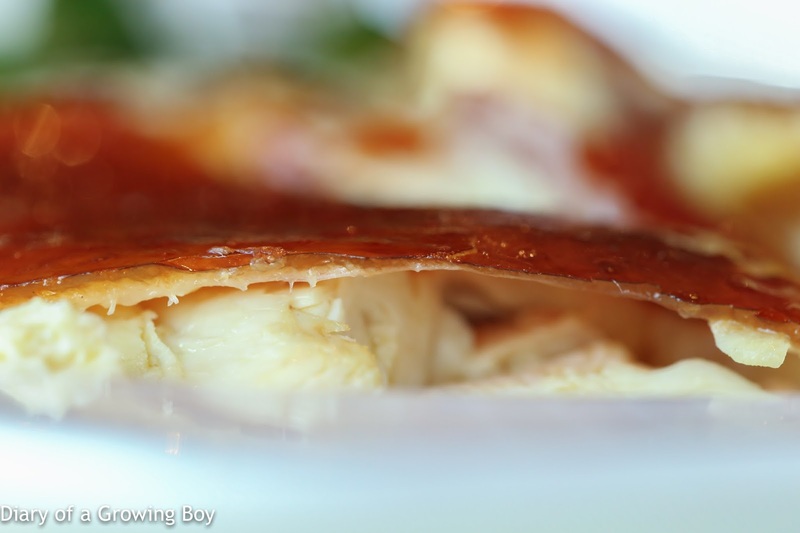 The prawns were rather translucent, and the crunchy texture just didn't seem very natural. The flavors were completely fine, though, and I really liked the black garlic, black beans and red shallots, and managed to endure the spicy kick from the chili peppers. Lung King Heen roast chicken (龍景脆皮雞) - my friend is a huge fan of the crispy roast chicken, so the two of us shared half a chicken. Chef Chan made sure to tell us that they only use live chickens at the Four Seasons - which were slaughtered the same morning - even for their banquets. 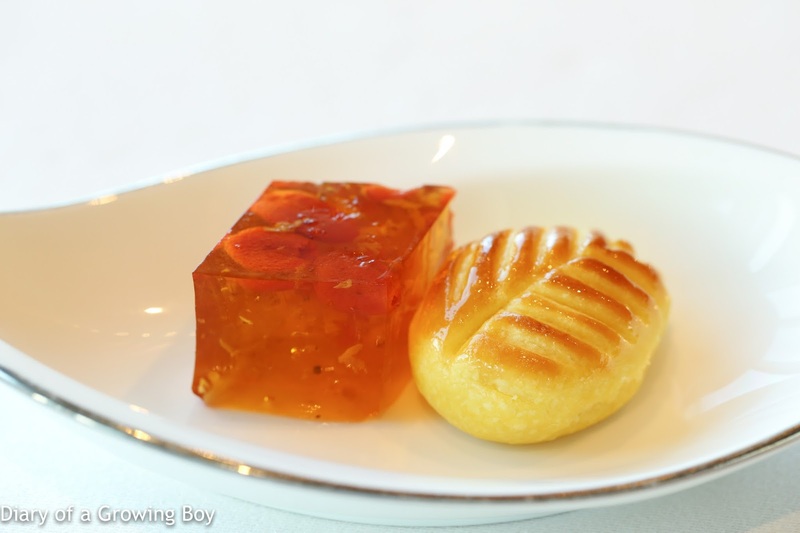 Petits fours - the baked cream custard puff (楓葉奶黃酥) and the osmanthus and wolfberry jelly (枸杞桂花糕) are both as expected. A nice way to finish off a delicious lunch. We were fawned over pretty much the entire time while we were in the restaurant - from Chef Chan checking up on us both before and after our meal, to the free bubbly from the sommelier, to the very attentive service... and even the manager of the hotel - who is a friend of my friend - stopped by to say hello. Service has always been one of the highlights here, and the restaurant remains the only one that I have been to where they take care to arrange the order in which they send out dim sum items in ascending order of flavor - starting with steamed items, then baked ones, and finally the deep-fried selections. Everyone else seems to just take whatever comes out of the kitchen and dumps them on the table. That alone makes these guys stand head and shoulders above the rest, so in spite of my misgivings about some of the food here, the experience is always a pleasant one.